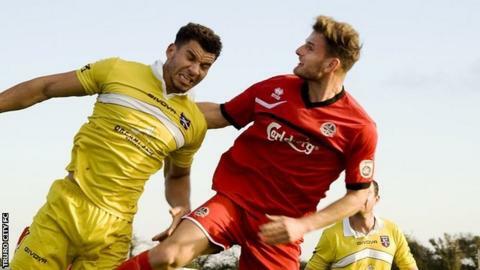 Truro City manager Steve Tully says central defenders Arran Pugh and Jamie Richards have been key to his side's recent success. The White Tigers have not lost in National League South since the end of August, a run of nine games. "Arran Pugh and Jamie Richards have been star performers for us this year," Tully told BBC Radio Cornwall. "I think they're unsung heroes, they do things that people don't actually see, they're great organisers on the pitch." And Tully says the duo are continuing to improve as seventh-placed Truro continue to climb up the National League South table. "They've been a massive asset to us and long may that continue," he added. "We keep asking them questions in training and pushing them, and the fitter they get they seem to be getting better."